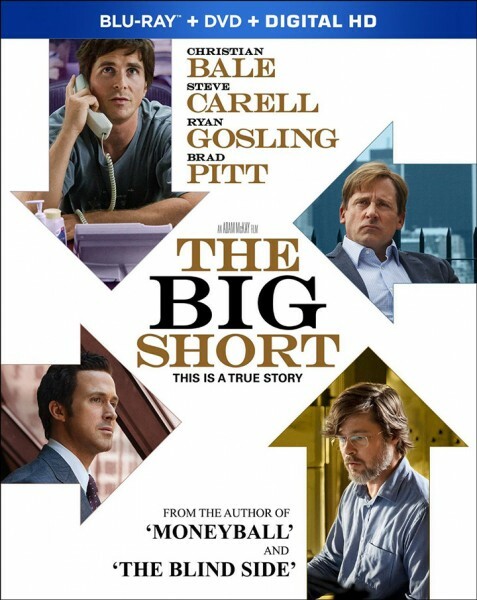 Paramount Pictures’ The Big Short has been released to Blu-ray Disc, DVD, and On Demand. The film was directed by Adam McKay and stars Christian Bale, Steve Carell, Ryan Gosling and Brad Pitt. The Big Short was nominated for five Oscars including a win for Best Writing, Adapted Screenplay. The Big Short on Blu-ray sells for $19.99 (MSRP $39.99). The 2-disc combo edition from Paramount Home Media also includes a DVD and Digital HD copy redeemable with either Apple iTunes or UltraViolet, and several bonus features such as the 16-minute casting featurette “In the Trenches” and deleted scenes. The Blu-ray disc is formatted in 1080p at 2.40:1 aspect ratio with audio available in DTS-HD Master Audio 7.1 as well as DTS: X — an alternative to Dolby Atmos that has up until now rarely been seen on Blu-ray releases. The Big Short was released early to Digital HD in Feb. 2016 and included several pieces of bonus content that varied depending on seller. The digital edition is priced at $19.99 from most services.